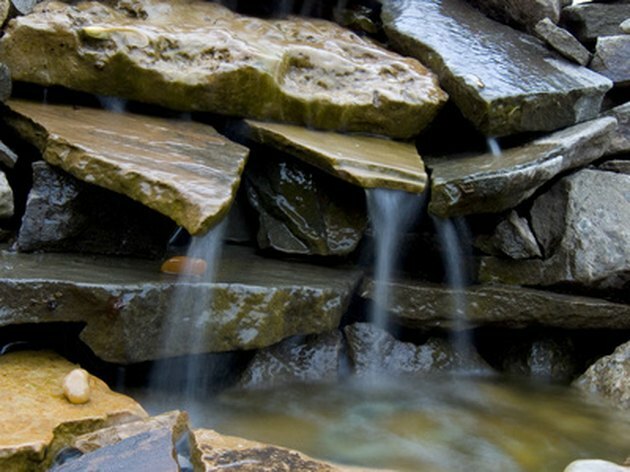 A miniature waterfall allows you to bring the soothing sound of a trickling stream indoors. Handmade miniature waterfalls can be expensive, but you can make your own one-of-a-kind version with rocks, glue, a pot and a pump. Use your mini waterfall as a table centerpiece, an aid for meditation or a way to set a pleasant, relaxing mood in your den. A miniature waterfall creates a relaxing mood. Purchase the smallest aquarium pump you can find along with about a foot of tubing. Find a bowl wide and deep enough to cover the pump. This bowl will serve as your reservoir. Thread the tubing into the end of the pump and place the pump in the bottom of the bowl. Cover it with large rocks to disguise it. Thread the tube through the rocks. Build a pile of rocks, shells, driftwood or other odds and ends for the water to cascade down. The pile should be above the bowl so that all of the water flows down into it. Fill the reservoir with water so that the pump is covered. Plug it in and move the tube to the top of the waterfall to make water cascade down it. Move the tube around and rearrange the waterfall until you are happy with the way the water flows into the bowl. Unplug the pump and let the area dry. Glue the pieces that make up the waterfall together using rubber cement, epoxy or some other waterproof adhesive. Glue the tube in place so that it directs water over the fall. When the glue dries, plug the pump back in.